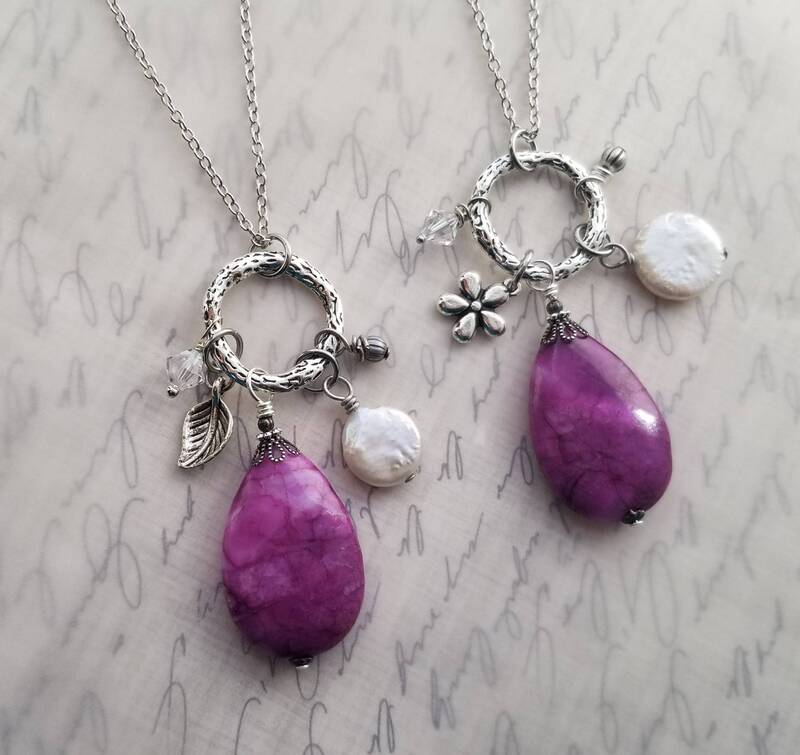 Gorgeous Rich Dark Pink Crazy Lace Agate teardrop beads which I clustered with a large white freshwater baroque style coin pearl and textured side bead , plus, I tried two different charms--a groovy silver daisy or boho silver leaf. I threw in a sparkling Swarovski Crystal as a side dangle for some extra pizzaz. Pendant falls almost 3 inches from the chain. Coin pearls are a smooth"baroque" style with natural formations. Crazy Lace beads are varied in natural color formations as well and will be similar and equally beautiful to what you see in these images. Necklace is 30 inches to the pendant cluster. Cluster is composed of Crazy Lace Agate gemstone beads, a white Baroque style freshwater coin pearl, Swarovski crystal and is finished with antiqued silver beads. Chain is antiqued silver plated brass soldered link and will wear well. Let me know at checkout if you'd prefer a different length from the 30 as shown. This chain does NOT have a clasp and is designed to slide right over your head.